Love Alice the Amorphophallus, who bloomed in all her stinky glory in September 2015? See how sweet she is now. After a successful pollination, Alice is producing fruit. Alice's fruit photographed October 19, 2015 and December 16, 2015. Each of Alice’s orange-red, olive-shaped berries will produce a single seed, and the seeds will then be collected. 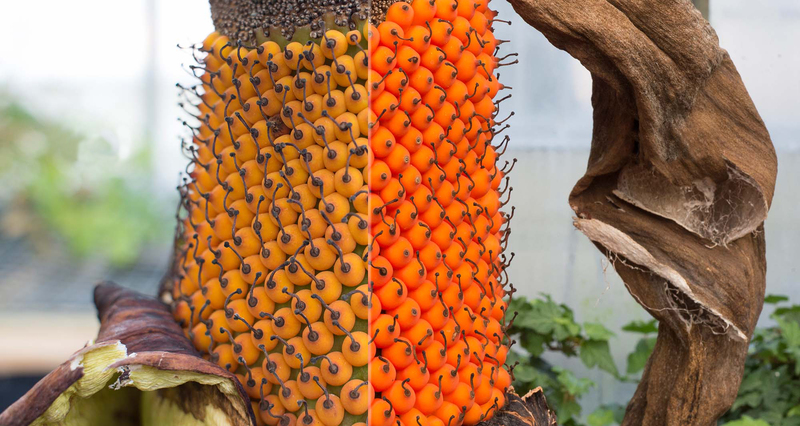 These seeds will contribute to vital titan arum conservation efforts at the Chicago Botanic Garden and other scientific institutions.